Is HRT the Right Treatment for Menopause Symptoms? During menopause, a woman's levels of estrogen and progesterone fluctuate and then drastically decline. This can cause a number of symptoms, like vaginal dryness, hot flashes, or loss of libido. Hormone replacement therapy (HRT) is a common treatment used to alleviate these symptoms by replacing the female hormones the body no longer produces after menopause. HRT uses a combination of estrogen and progesterone. There has been extensive controversy surrounding this treatment over the last few years, and more studies are being published about the risks of HRT. 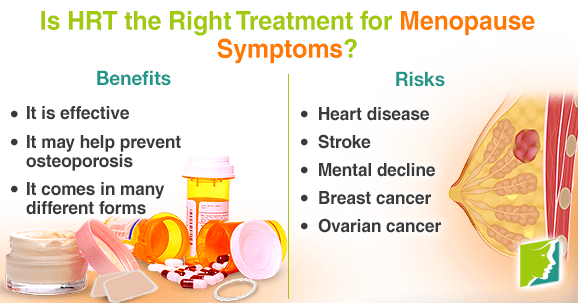 The main benefit of HRT is that it is effective in managing menopause symptoms, including hot flashes, vaginal dryness, and night sweats. HRT may also help prevent osteoporosis, because the increase in estrogen helps maintain bone density. HRT comes in many different forms: oral tablets, skin patches, vaginal creams, vaginal rings, and topical gel. HRT uses either estrogen only, or a combination with progesterone. This depends on many factors, including whether a woman has had a hysterectomy or not. Women who have not had a hysterectomy - that is, they still have their uterus - usually receive a combination of estrogen and progesterone. On the other hand, women who have had a hysterectomy and therefore do not have a uterus normally receive just estrogen. In general, doctors recommend that patients who choose HRT take the lowest possible dose for the shortest amount of time (typically, no more than six months) because of the risks linked to HRT. Heart disease. HRT may increase the risk of heart disease and heart attack in older women. Stroke. HRT may raise the risk of stroke and is also shown to increase the risk of blood clots. Mental decline. Multiple studies have shown that HRT may elevate the risk of cognitive decline. Breast cancer. Numerous studies have shown that postmenopausal women who take combination of synthetic estrogen-progesterone are at a higher risk of breast cancer. Ovarian cancer. Long-term use (more than five years) of HRT may increase the risk of ovarian cancer. The risk appears substantial for women who take estrogen only. Now that the risks and benefits are more apparent, it is easier to make an educated decision about HRT. Although it can be effective, it is important to keep in mind the possible long-term risks directly linked to HRT. While this is an option for managing menopause symptoms, keep in mind that there are other natural methods that may be helpful as well.Learn more by clicking on the following link focused on the 3 main approaches to face menopause. What Forms Does Ginseng Come In? It's difficult to completely cut out unhealthy foods or foods that trigger menopausal symptoms from your diet, but what we eat influences how we experience menopause, and some foods can trigger or worsen some menopausal symptoms.Read on 5 foods to avoid during menopause.